Distressing refers to a surface treatment of fabric that makes the material appear faded or wrinkled, as if from long, steady use. In order to obtain good results in distressing, it is important to have a good understanding of the fabric being treated. Necessary information includes the types of fibers that make up the fabric, how the fabric was made (for example, is it woven or knitted), the dyes used to color the fabric, and any other treatments or decorations that the fabric has undergone. Various sorts of fabrics can be distressed, and techniques for each may vary. The most commonly encountered distressed fabric in modern times is denim. Almost everyone has a favorite pair of jeans whose fabric is worn in all the right places and washed out to the perfect color. Repeated wear may be the only natural way to get jeans just the way one wants them, but there are many ways to distress the denim to instantly create a pair of "worn" jeans. Fabric along the pocket tips may be distressed by using a sander or file to fray the denim until it has acquired the preferred look. The goal is to create wear in the fabric, but without tearing it, in any place where the jeans would normally show signs of wear. 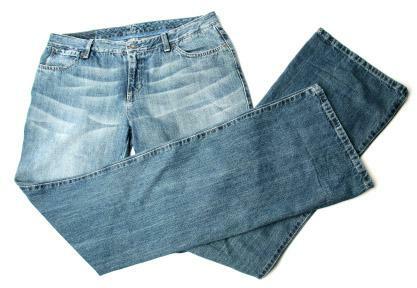 Jeans can also be distressed when laundering them by adding some pumice stones to the washer; the effect is enhanced by using cold water and a detergent that contains no brighteners. Using such methods, it is possible to make a do-it-yourself project of distressing jeans, but most people in the early 2000s prefer to purchase pre-distressed denim. This trend has changed the jeans business, because the cost of worn-look jeans is almost double that of new jeans. This style started catching on in the early 1990s, according to the New York Times, when fashionable young Japanese consumers began to seek out used older jeans. The discovery of jeans as antiques quickly created a market for "antique-look" jeans, which manufacturers were happy to supply. Pre-distressed denim is processed with bleach and potassium permanganate, tumbled with pumice stones, and digested with enzymes. Techniques of distressing fabric have existed long before the fad of distressed jeans, however. Theatrical costume designers have been using distressing techniques to make costumes more believable for many years. Distressed fabric is often used in costumes for movies, TV shows, and theatrical productions. Almost every movie wardrobe is likely to include at least one garment made from distressed fabric. Costume designers for westerns, horror films, and other film genres pioneered the techniques of fabric distressing that have come to be used in fashionable clothing in the early twenty-first century. Russell, Douglas. Stage Costumes Design. New York: Prentice-Hall, 1973. Family Education Network. 2004. "Distressed." Infoplease.com Dictionary. Available from http://www.infoplease.com/ipd/A0411265.html .